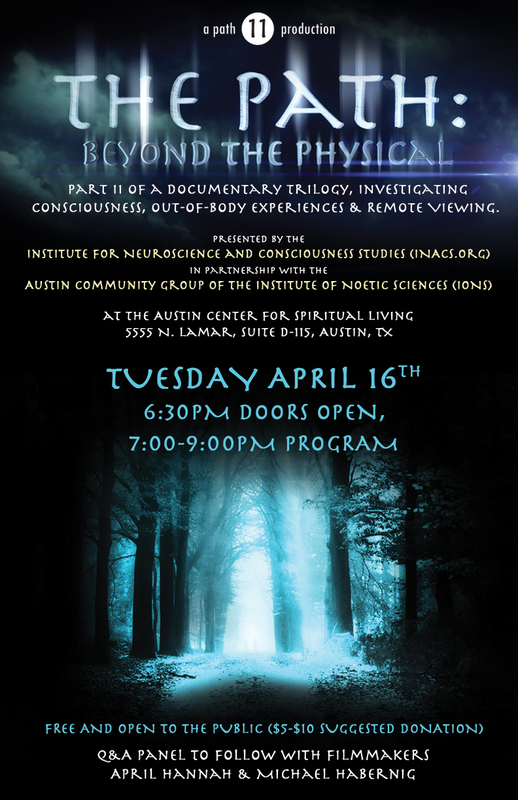 Tuesday, April 16, 2013, 6:30 p.m.
Join producer April Hannah and director Michael Habernig for a screening of their latest film, Beyond the Physical. Part II of The Path Documentary Series, the film investigates topics of out of body phenomena, remote viewing, and multiple dimensions. (Part I, Afterlife (2009), explores the concepts of life after death and encounters with what happens to the soul when it leaves the physical body.) Much of the new film was shot at the The Monroe Institute in Faber, Virginia, and features TMI’s former research director and president F. Holmes “Skip” Atwater, its former executive directer Paul Rademacher, leading out-of-body expert William Buhlman, and professional physicist Thomas W. Campbell, author of My Big TOE. A question and answer panel with the filmmakers will follow the screening. For more information about the event, films, and DVDs, please visit the links below.